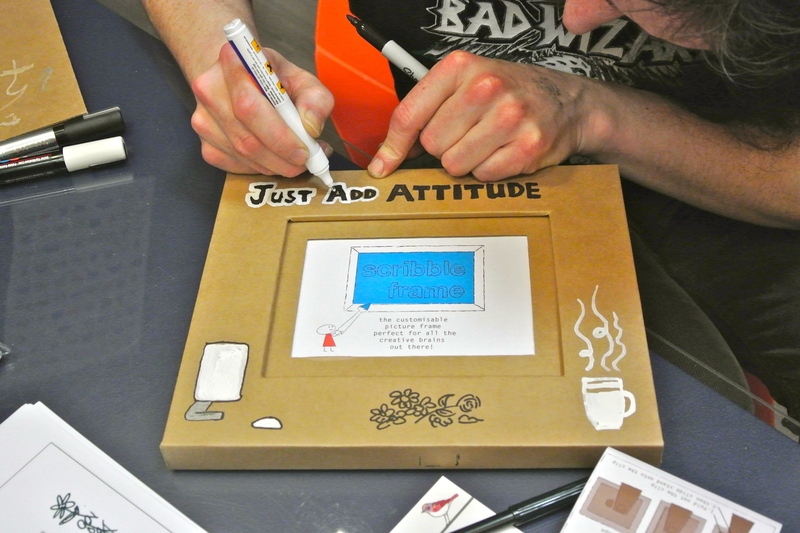 Last Friday evening I went to ‘Scribble Dublin’, which was hosted by Designist a design store on Dublin’s South Great George’s Street. 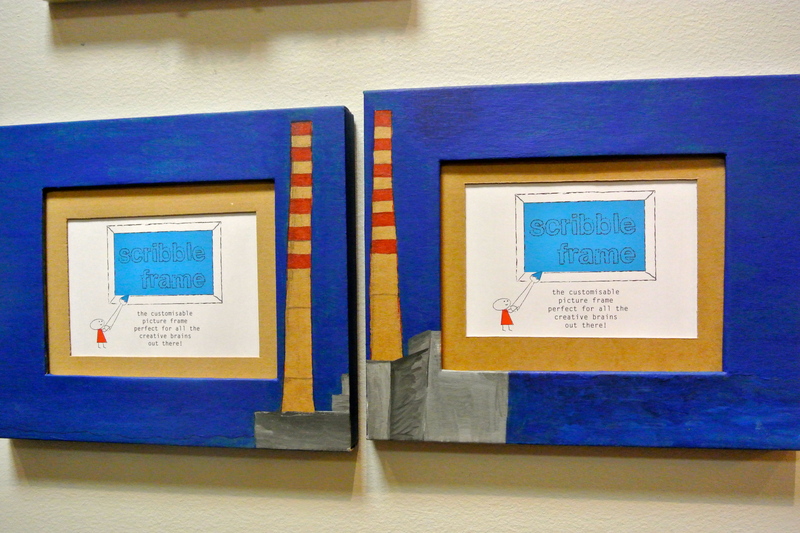 The ‘Scribble Dublin’ event showcased product design company Klickity’s scribble frame. The Klickity scribble frames are exactly what they say they are; frames to scribble on, or indeed as the mood takes you to decorate in whatever way your imagination decrees. Barbara Nolan and Jennie Flynn the co-owners of Designist say that ‘Being creative can be hard. We need inspiration …’ so they came up the rather genius idea of providing some inspiration by inviting a number of creatives to decorate a selection of scribble frames. The twenty plus embellished frames are on display at Designist and will be until the end of this week; they are being sold by silent auction. Jenny and Barbara also invited Mark Flood an animator and illustrator to take part in the event. So the good news for those who attended Scribble Dublin on Friday was that if they bought a scribble frame Mark was on hand to illustrate it for them. 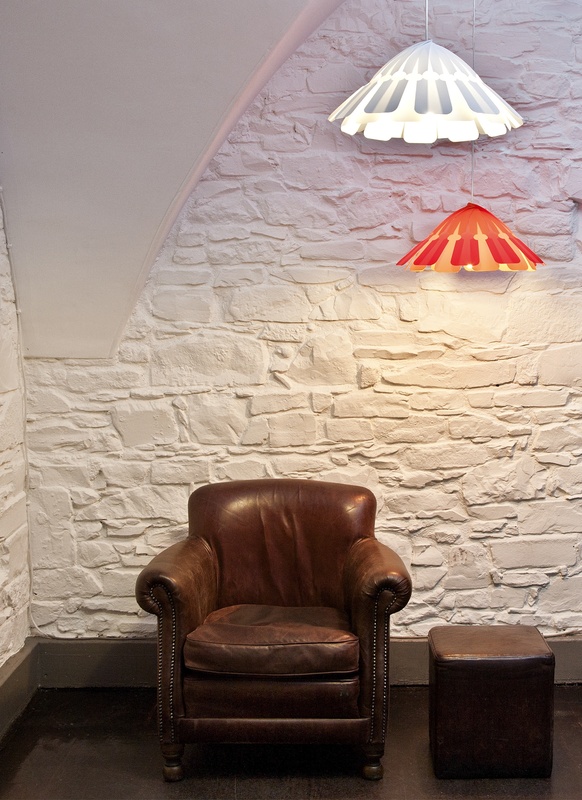 Klickity is a Dublin based product design studio established by Kate Cronin and Elizabeth Fingelton in 2011. Elizabeth the business brains of the enterprise is a chartered accountant and Kate the creative force is an honours graduate of NCAD (National College of Art & Design) who is currently doing her Masters in sustainable design. They say on their website that they ‘create contemporary affordable products all manufactured in Ireland’ and that their ethos is ‘to produce well considered design with the environment in mind’. 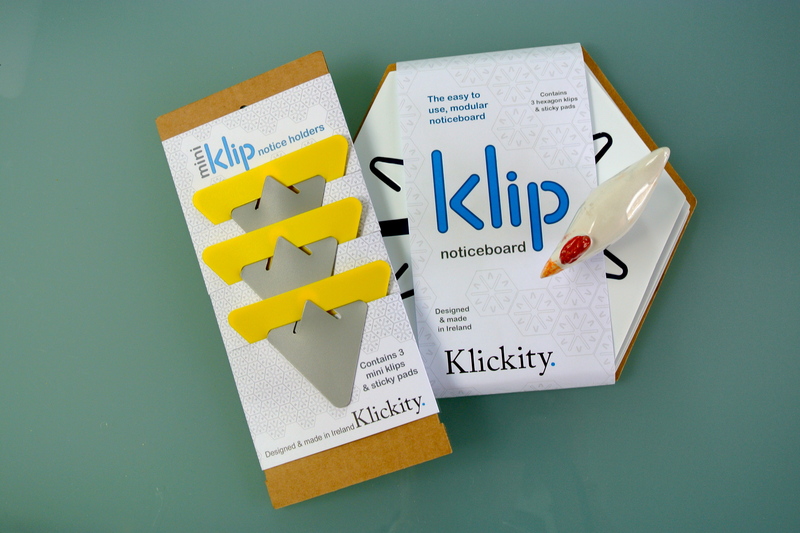 Klickity has an interesting, innovative and aesthetically pleasing product range which includes aside from the scribble frames; customizable scribble storage boxes; colourful design led lighting; a contemporary clock with a classic feel; and Klip a modular notice board. Although just in its second year of trading Klickity has garnered a fair amount of press coverage and on Kate and Elizabeth’s first outing to Showcase Ireland in 2011 they won the best new product award in the tabletop and interiors section with their palm light. Klickity products are stocked in a number of shops in Ireland (they are also available for sale at http://www.klickity.ie) and two recent trips to trade fairs in London saw the company place products with UK retailers. I wish both Designist and Klickity every future success. Photo Credit: the image of the palm lights was taken by Kate Cronin. That photo with the chair and the lights is fabulous. Thanks for showcasing Klickity and Designist. It looks like you got a frame for your blog. How fun. I agree the photo with the chair and the lights is fabulous. I wish I could take photos like that – all credit is due to the talented Kate from Klickity. I love my *blog* frame. I bought a frame and didn’t fill it so that I could draw on the glass. This takes it all a step further.. love it! Ooh drawing on the glass sound fabulous especially as I recall seeing some of your lovely artwork on Just A Smidgen. I love the scribble frames too – I bought a *blank* one so I could decorate it myself and have been mulling over what I might do with it.